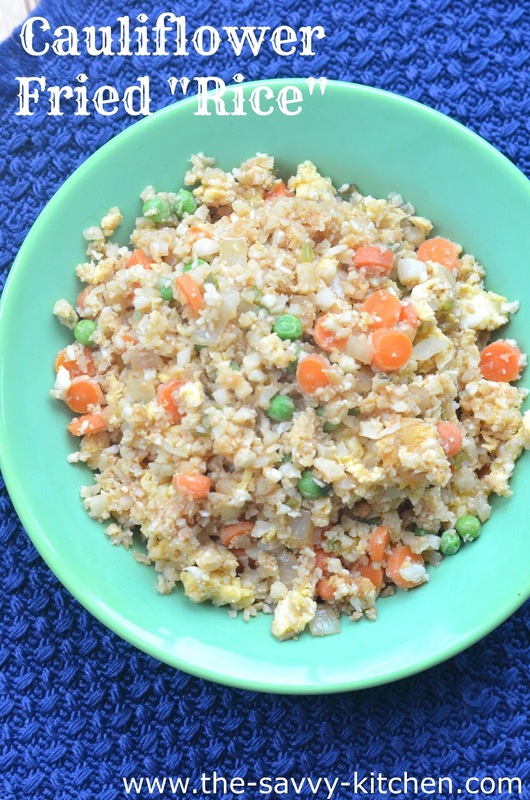 Cauliflower rice is the new "rage" these days, so I was eager to try it in my favorite fried rice recipe. The only substitution I made was subbing cauliflower for rice or quinoa, and this easy meal turned into a low-carb, delicious and super filling meal. Chris and I honestly couldn't taste even one hint of cauliflower. 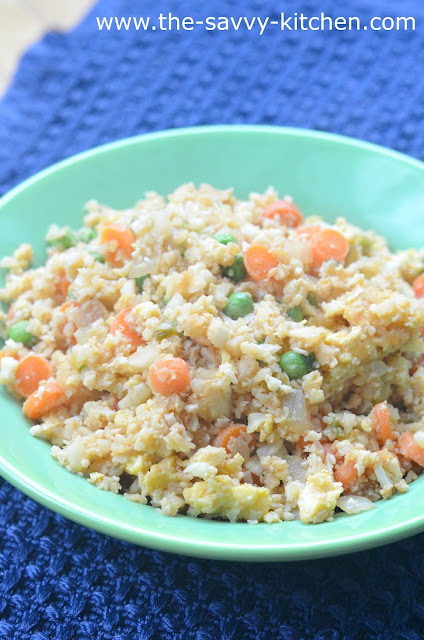 It was so, so yummy and incredibly healthy, so I think this might be my go-to fried "rice" recipe from now on since the kids gobbled it up, too. Enjoy! Mix mix sauce ingredients (teriyaki, soy sauce, and sesame oil) together in a small bowl. Set aside. Heat 1/2 tbsp. olive oil in a large sauté pan over a high heat. Add onion and carrot and cook for two minutes. Add scallions, garlic and ginger to the pan. Cook another two minutes. Add in the rest of the olive oil and the cauliflower. Stir-fry for about two minutes. Add sauce to the pan and stir-fry until incorporated, about two minutes. Make a well in the center of the cauliflower mixture and pour eggs in. Scramble the eggs with a spatula. Once cooked, combine with the rest of the cauliflower mixture. Add the peas, then toss everything together until the peas are warmed through. Serve immediately or at room temperature. Chris and I are really big on making something special for each other on Valentine's Day rather than buying big, expensive gifts. I really enjoy this tradition because it makes him think outside the box and do something heartfelt for me ;) I made him these Whoopie Pies and they were a huge hit (and surprisingly they didn't take too long to make!). Enjoy! Make the cake according to the package directions for a 13x9" cake. Bake and set aside until fully cooled. Using your desired shape cookie cutter, cut out shapes into the cake and move each piece to a wire rack. Spread 1-2 tbsp. of marshmallow fluff onto one cutout and then top with another piece of cake to make a sandwich. Meanwhile, add the chocolate chips to a microwave-safe bowl. Microwave for 30 seconds, stir, and then microwave for another 30 seconds. Continue to microwave in 15 second increments until the chocolate is fully melted. Pour the melted chocolate over top of each whoopie pie. 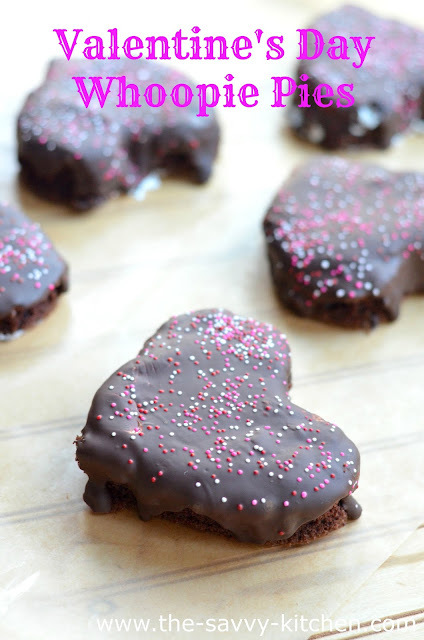 Top with sprinkles and allow the chocolate to completely harden. Store in an airtight container. Other than bottled teriyaki sauce, I think the one thing Chris couldn't live without is vinegar. Therefore whenever I see a recipe with any type of vinegar in it, I'm pretty sure he'll like it. This chicken dish was no exception. 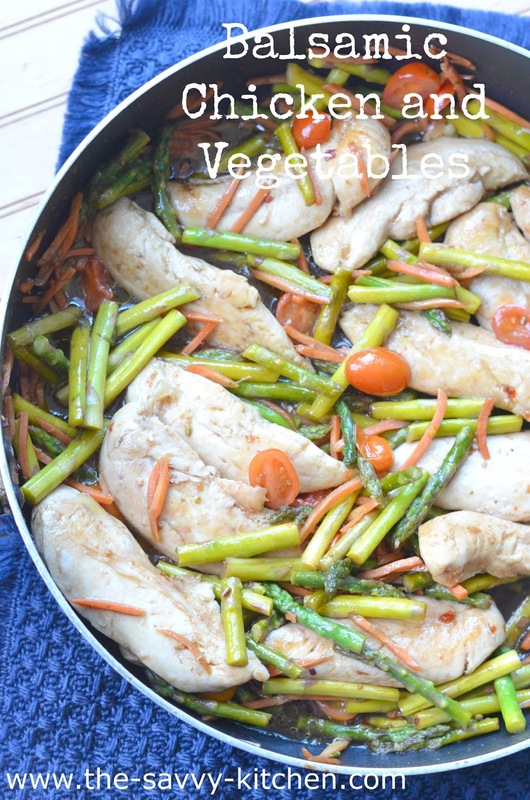 Since it's made with the asparagus, carrots and tomatoes right in the pan, I didn't even have to dirty any additional pans making a separate side dish (always a plus in my book). Enjoy! 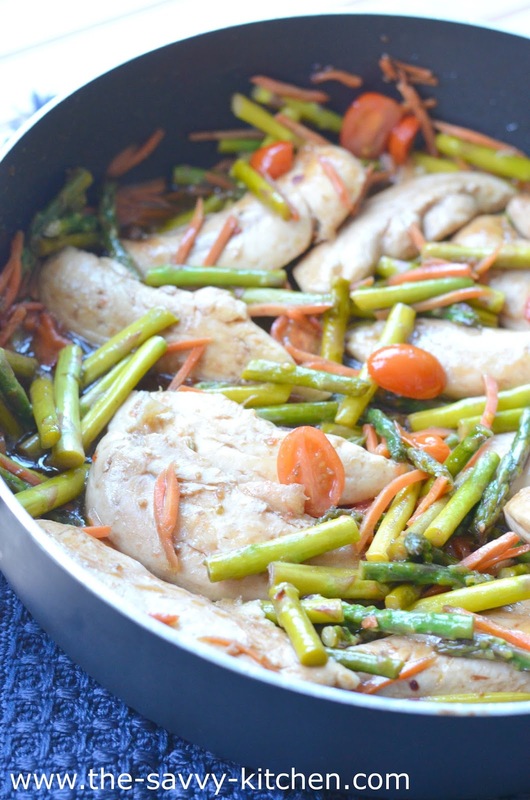 Add asparagus and carrots to skillet. Cook and stir for 3 to 4 minutes or until asparagus is crisp-tender; transfer to serving platter. Stir remaining dressing mixture; add to skillet. Cook and stir for 1 minute, scraping up browned bits from bottom of skillet. Drizzle the dressing mixture over chicken and vegetables. Sprinkle with tomatoes. Makes 4 servings.